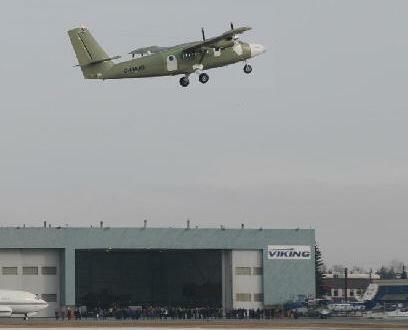 February 19, 2010 - In advance of Transport Canada certification, the first new-production DHC-6 Series 400 Twin Otter has taken its initial flight from Viking’s final assembly facility in Calgary, Alberta. Aircraft, manufacturers serial number (MSN) 845, Canadian registration C-FMJO is the first new production Twin Otter since de Havilland Canada ended production in 1988 with the delivery of MSN 844. Sold to launch customer Zimex Aviation of Switzerland, MSN 845 is equipped with Honeywell’s Apex IFR digital flight deck, including FDR & CVR and configured with a commuter interior, the aircraft is to be used throughout North Africa servicing the oil and gas industry. The first production aircraft has been registered C-FMJO in honor of Michael J. Orr, a former member of Viking’s Board of Directors. Mike was a keen supporter of the plan to re-start Twin Otter production and sadly passed away on October 10th, 2006. In keeping with Viking tradition of naming aircraft, “Mikey” has been fondly added to the nose of MSN 845. Several of Mike’s family was in attendance to witness the first flight. Viking announced the production re-launch of a modernized Twin Otter in March of 2007 with the introduction of the DHC-6 Series 400 model, which features over 400 modifications and improvements centered around a completely modernized flight deck and added safety systems while retaining the legacy aircraft’s famous robust airframe design. Most notable of these changes is the incorporation the fully integrated Honeywell Primus Apex digital avionics suite, and Pratt & Whitney PT6A-34 turbines engines to support the aircraft’s unsurpassed capability in specialized operating environments. With Canadian certification imminent, Viking expects first customer deliveries to start shortly. Manufacturing activities have continued through 400 Series development, with the first ten serial numbered aircraft at various stages of final assembly, and production gearing up to reach a steady build rate of one and a half aircraft every four weeks. Viking celebrating 40 years in business provides OEM support for the worldwide fleet of de Havilland heritage line of aircraft (DHC-1 through DHC-7). Viking is part of Westerkirk Capital Inc., a Canadian private investment firm with substantial holdings in the hospitality, aviation and real estate sectors.